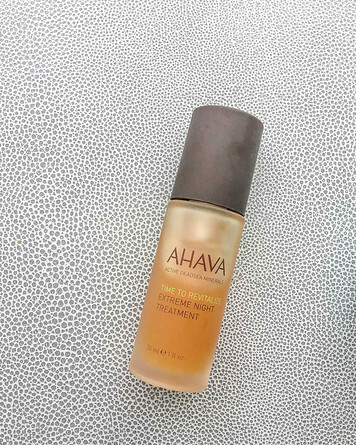 Thank you to Ahava for sponsoring this post. Last year, my skin was dry, red and sensitive. I had deep red marks that wouldn’t go away, tiny bumps all over my forehead and deeply dehydrated cheeks. With constant travel, a poor diet and a non existent skin care routine, it wasn’t really a shock.. but it was embarrassing and uncomfortable all the same. By the time the holidays rolled around, I decided to stop traveling for a bit and focus on myself. 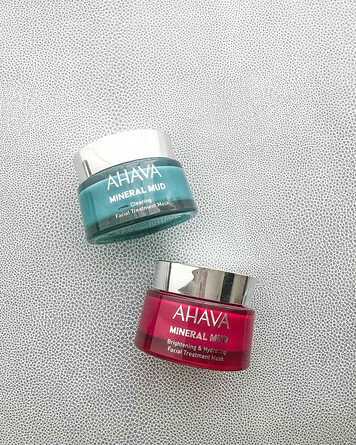 I looked for nourishing, hydrating skincare products and discovered Ahava, an Israeli based skincare line that uses minerals from the Dead Sea in their skincare line. After a couple months, my skin has come a long way! 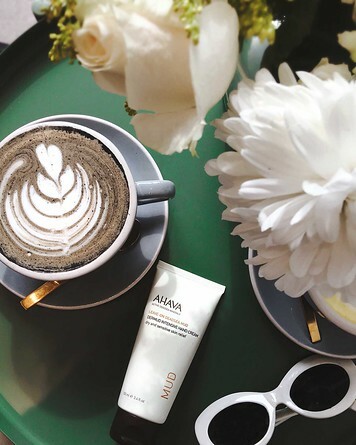 In today’s post, I’m sharing the skincare routine that transformed my face as well as the Ahava products which made it happen! Also, I’m giving away a set of these AHAVA products so you can try them out too! Giveaway details at the end. I first discovered AHAVA when I visited Israel. The company’s signature skincare is formulated with nourishing elements from the Dead Sea, famous for being the most mineral rich mud on earth. All of their mud products detoxify the skin while nourishing it with hydration. 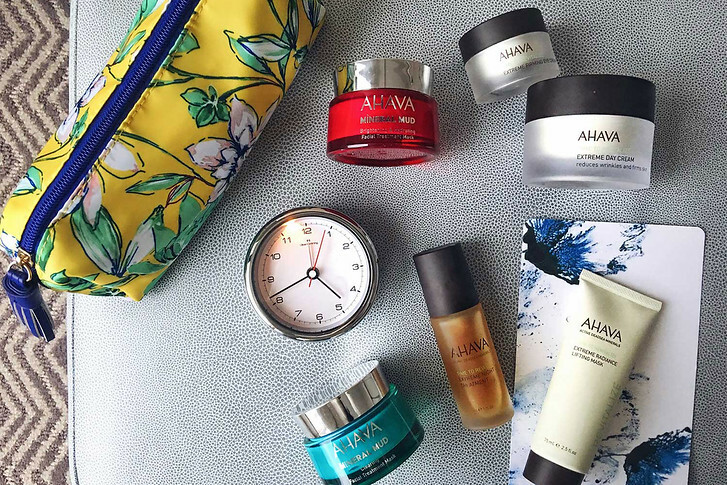 AHAVA’s skincare products are paraben free and safe for those with sensitive skin. This is a concentrated night-time treatment that helps restore firmness to the skin and smooth deep wrinkles. After cleansing, I massage 2-3 drops onto my face and neck. It feels rich, but not heavy, and makes my skin feel hydrated and supple. The formula is like a thick serum, without the oiliness you get from facial oils. This treatment has gone a long way to evening out my skin tone and making my skin brighter, firmer and more hydrated. The combination of Dead Sea minerals and Himalayan extracts create an antioxidant effect to protect my skin from environmental aging. I love that it contains AHAs, which are essential for chemically exfoliating the skin and promoting healthy cell turnover. This serum is a must! If you’re searching for a rich cream, you’ll love this. It’s formulated with Dead Sea minerals to deeply hydrate and has a buttery texture with just the slightest scent. I love using it as a day cream since it goes on silky smooth and makes a great base beneath makeup. I also use it at night since it’s so moisturizing. There’s no SPF (which I prefer as I wear my own sunscreen) so it’s a multi-purpose day and night cream. 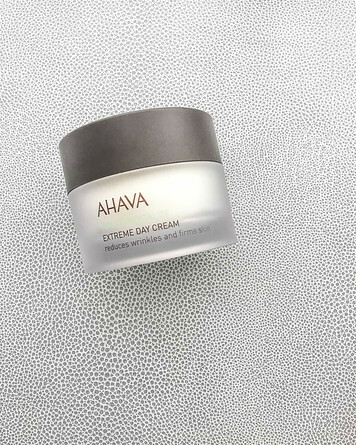 AHAVA’s skincare products contain a proprietary blend of Dead Sea extracts to dramatically boost your skin’s moisture levels. In the Extreme line, you’ll also find Himalayan extracts which combat environmental aging, reduce wrinkles and restore firmness to the skin. My face always feels nice and plump after I use this. Finally, there’s a natural form of retinol in the cream from Dunalliela Salina Algae, which helps strengthen and promote healthy skin. This is a must for sensitive skin! Once a week, I’ll treat my skin to a mask. 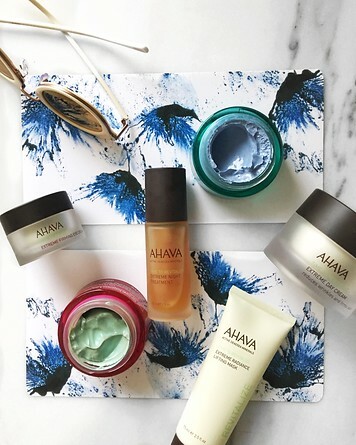 I’ve been loving these two from AHAVA: the Brightening & Hydrating Facial Treatment Mask and the Clearing Facial Treatment Mask. Because I have dry skin, I reach for the Brightening mask more often. When I feel breakouts coming on (or if I’ve eaten too much greasy pizza…) I’ll use the Clearing mask. Both are meant to be left on for ~30 minutes and then washed off. I used to avoid mud masks because I thought they were for acne prone skin, but these AHAVA masks use Dead Sea mud which is extremely hydrating! The mud adds moisture back into my skin while simultaneously purifying out oil and debris. It also contains Vitamin B3 to brighten and feels nicely cooling. The mask has a bright green color, which is really fun to put on, and helps neutralize my redness. Give this a shot if you like colorful, hydrating masks and want brighter, more even toned skin. 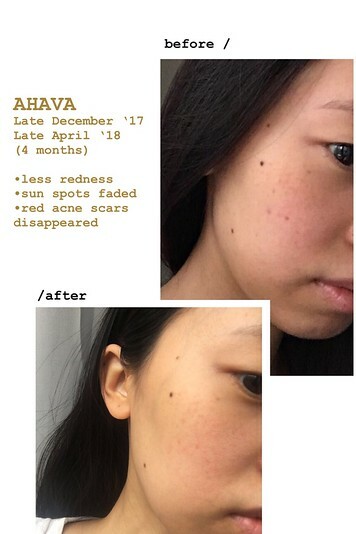 I’m giving away a bundle of Ahava products for you to try! Enter on my Instagram here. 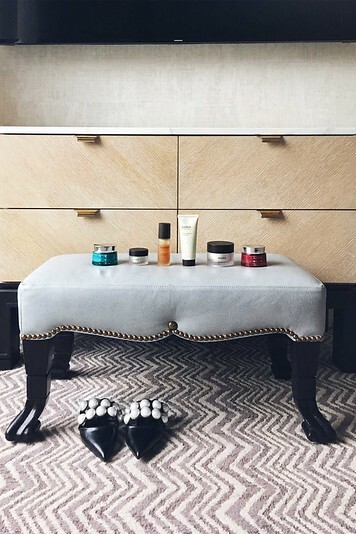 What skincare products do you swear by? Let me know in the comments!